What makes someone a good leader? That's a loaded question, right? It depends on the situation. The type of leader needed in a combat situation seems different that the type of leader needed in a kindergarten classroom. I read and think a lot about leadership. The topic fascinates me. I want to be a good leader. I want my boys to be leaders. I also want to honor my personality in the process. I never what to try to be someone I'm not in order to be seen as a leader. Which is different from learning and growing. See? It's complicated. It's loaded. 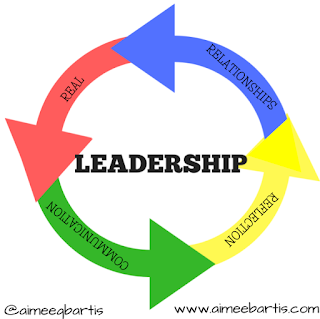 I think there are 4 things that are essential to all leaders, no matter the situation. And they're all connected. I think of them like a big circle. 1. Be Real - Be yourself while learning and growing. Be honest. Own your faults. Embrace your quirks. Be genuine. 2. Build Relationships - If you can't connect with people, you can't lead them. Take the time to get to know people. What are their hopes and dreams? What scares them? What's important to them outside work or the context you know them in? This is easier if you're real because they'll get to know you too. 3. Communicate Clearly & Effectively - Mean what you say and say what you mean. Hard conversations are hard. But when you're the leader you have to have them from time to time. But guess what, if you've been real and built relationships, it's easier to have those hard conversations because people know they can trust you. 4. Be Self Reflective - Take time each day to think about your interactions with people and the work you did that day. Did things go the way you thought they would? Are you proud of how you handled things? What areas do you need to improve on? Reflecting will help you become more self aware and that will help with the other 3. What do you think? What are the essentials for leaders?